Rollerblading - Menace II Society ? 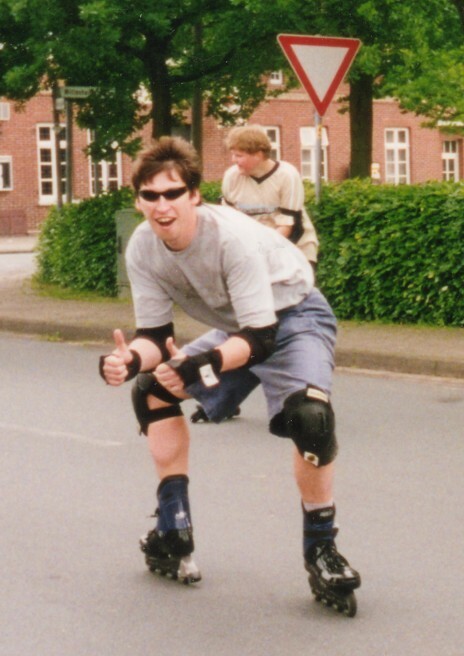 Yes, rollerblading is great fun. Especially on 'black ice'. In my hometown there's an industrial area with really good asphalt. And late in the evening, there's no traffic: No cars, no trucks, almost nothing. Except a cop on a motorbike. And from him you learn that inline skating on roads is prohibited because skates are toys, and with toys you must use the sidewalk. And if you get caught, you'll be fined 10 German Marks (about 5$) - and you are lucky, because this is the maximum fine for pedestrians ... Don't believe me ? Have a look !